A gas tank explosion is never a good thing. And just after 1 PM today, one exploded in Sissonville, WV that wiped out several homes and has set both sides of Interstate 77 on fire. 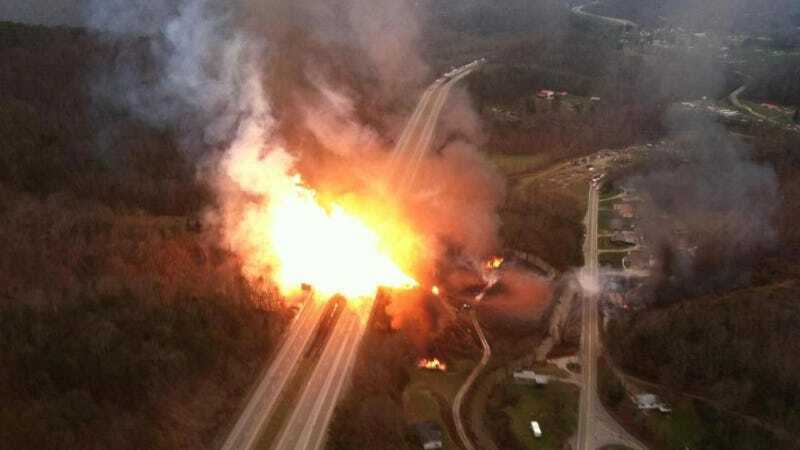 The explosion, reportedly of a natural gas well, has caused flames to spread across both sides of the interstate, shutting it down completely. The fire is still raging even though the gas company is there and working to turn off the pipeline. While that is making the flames die down slightly, it is still incredibly dangerous. As you can imagine, shutting off the pipeline is a delicate process and the crews are being very careful with how they do it. Several homes have been leveled due to the explosion and there are reported structural fires in the area. There is no word on injury or death in those homes yet. Part of the problem is that responders are unable to reach homes in order to assess if people have been injured. It's just too hot. Thankfully nobody was injured in a nearby nursing home. Schools are continuing as normal, but the students are being held inside simply because they cannot cross the inferno to get home. And this is what it looks like where the flames scorched the road. This thing is melted. If any West Virginia Jalops are near the site of the fire and can get safely in a reasonable distance, post your photos in Kinja below and let us know what the scene is like. UPDATE 4:01 PM: The fire is out, but the road is still closed.